Also, a publication date--January 8, 2010. Description--"Animals are both like and not like human beings. Animalkind is about the similarities and differences and what they mean for us, morally speaking. If we owe animals anything, Kazez asks, must we owe them exactly what we owe each other? 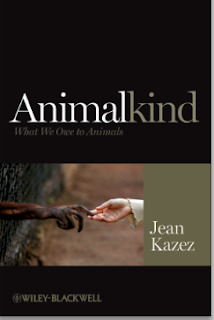 Drawing on philosophical analysis, empirical evidence, and engaging tales, Animalkind urges 'all due respect' for other creatures, instead of egalitarianism or outright dismissal. Kazez urges that even on this moderate basis, we must recognize our current treatment of animals as a moral outrage and initiate reforms on a personal and societal level. Both philosophical and practical, the book will appeal to the general reader as well as students and professionals." Table of contents here. Congratulationss Jean! Great name as well. Look forward to having a read next year. Ps missing your contributions to talking philosophy blog! Oh well. Yeah, it's a bit like entering a retirement home over here. Very quiet! But maybe things will liven up over time. Looking forward to reading your book. I want to know what the foundations of the respect I owe are, and if they go any farther than an education of sentiments. And wow that is a remarkable and affecting photograph on the cover. Great to hear that your book will soon be out. When it's time for the Spanish translation, I'm your man. Faust, I love that photo too. The good people at Blackwell made a great choice. Amos, Wouldn't that be cool? I wish I could set you us as a translator, but unfortunately these thing seem to happen out of the blue. One day I got a letter saying my first book would be translated into Korean. A year later, there it was--in Korean. The book is beautiful, but I have no idea if the contents is gibberish. Amos, if you want to translate AnimalKind, or The Weight of Things for that matter, then you can write to me: dale.morgan@wiley.com.